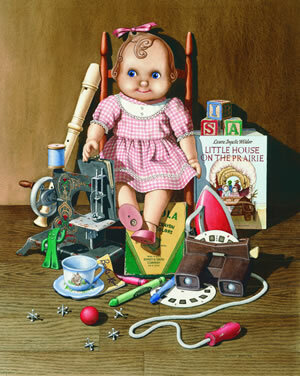 "The Kids Room: A Pair of Prints"
Tucked away in almost everyone's storeroom or attic is an old box of toys. The battered survivors of many hours spent in a world of make believe. It was a world that existed in our mind, perhaps, but it was the world where we were master and where the sun climbed over the trees with a golden promise each morning and all those make believe friends loved us and behaved exactly as we wished. Later in life, when we have kids of our own, they are sometimes allowed to play with our old friends but there is always the anxiety that one will be broken and there is almost always one or two special toys, a doll, a toy train, that even our own children are not allowed to do more than hold for a few minutes. This may seem selfish but it is actually the process of holding on to a dream. And in holding on to our dreams we gain a better understanding of our own children. We allow them to dream their own dreams and perhaps we may put some of their toys in a box for their eventual return home in search of those magic years. Under the overall title "THE KIDS ROOM" Dempsey Essick has created companion paintings honoring little boys and little girls with the individual titles "HIS THINGS," and "HER THINGS." To populate the paintings with a representative selection of toys primarily from the "Baby Boomer" generation he borrowed from several sources to augment items that belong to he and his wife, Shelley, and their grown children, John and Beth. From the Baptist Children's Home Museum he got jack-rocks, a child's sewing machine, a yo-yo and a Fly-Back paddleball. Mickey Huffman loaned the Kewpie doll with the articulated wooden arms and legs which is the central figure of "HER THINGS.' 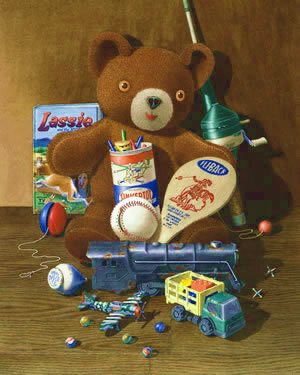 The Teddy Bear in "HIS THINGS" is like the one Dempsey grew up with. Dempsey also furnished his old train engine along with some marbles and a model of the fighter plane used by the famous Ace Frank Gabreski. The fishing rod belonged to Dempsey's grandfather, Olin Essick. Olin's great grandson, John, provided an old baseball and a Tonka truck to balance great granddaughter Beth's recorder and surviving cup and saucer from her tea set. Caroline Baker provided a genuine Gumby and Shelley furnished the Barbie & Ken book along with the iron and purse. Three alphabet blocks with the letters I, S, and A form a silent tribute to three ladies who figured prominently in Dempsey's early career. The "S" is for Sallie Parnell, ("Aunt Sallie's Loom"). The "A" is for Alice DeLapp, ("Good Morning Miss DeLapp"). And the "I" is for Irena McCormick, ("Springtime at Irena's"). These wonderful ladies are no longer with us but they will live forever in our hearts. In the two complimentary pictures Dempsey Essick is at his best. He has captured the essence of childhood and projected that wonderful time of life onto the broader screen of adulthood. In the process he not only has reminded us all from whence we came but has forecast something of the future. No grownup can fail to smile when viewing the two paintings of THE KIDS ROOM because every man and woman will see something familiar, something to bring back those days when they were boys and girls and the whole world was encompassed by their boundless imagination.